Don’t you just love those trips when you can wander off the beaten path and discover something amazing? New Lanark, Scotland was definitely one of those hidden gems. In September 2010, my husband Mark and I rented a car to tour Scotland. Having our own wheels gave us the great advantage of freedom. We were able to make spur-of-the-moment decisions and detours while marvelling at the beauty and lushness of the Scottish countryside. We were actually driving back to Glasgow at the tail end of our trip when we saw a roadside sign advertising a Victorian Fair. Everyone should attend a Victorian Fair at least once in their life. We hadn’t heard of New Lanark and it wasn’t on our list of places to see, but the modest little sign by the side of the road seemed to beckon to us. The size of the parking lot alone made us wonder if this site was a bit bigger than we had assumed. Then we got our first glimpse of the buildings, and we realized we were probably going to be here longer than we first anticipated. 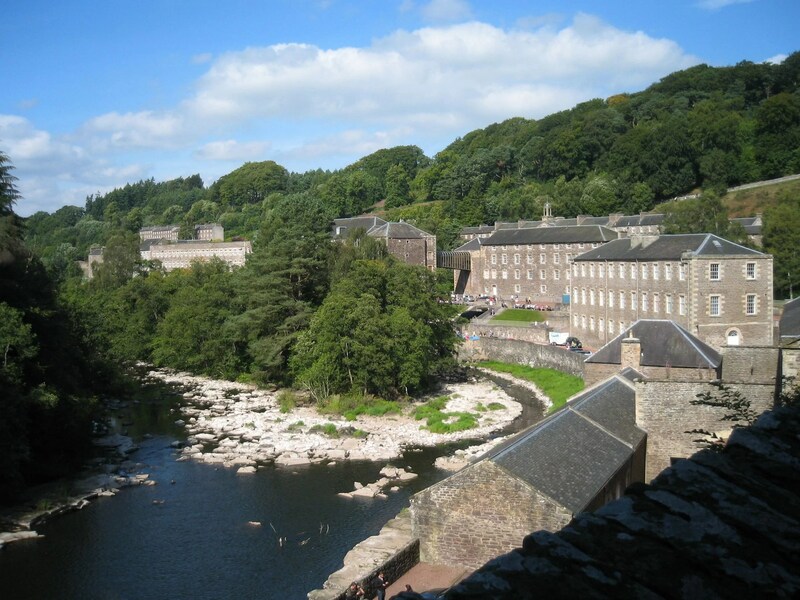 New Lanark is a restored 18th Century cotton mill/village, which once had over 2,000 people living or working here. This in itself may or may not be impressive to you, but consider this: the manager and part-owner, Robert Owen, believed in providing humane working conditions, social and education programs, and factory reform. He was also the founder of infant childcare in Scotland. In the 18th Century. Just let that sink in for a moment. Well, sure, he did still use child labour. In those days, who didn’t? But he eventually abolished child labour, along with corporal punishment, which was incredibly advanced thinking at the time. On the day we arrived, their Victorian Fair was in full swing. They had music, jugglers and other street performers. My personal favourite area was a birds of prey exhibit. You could get your photo taken with one of these majestic beauties for a small fee (which went to the upkeep of the birds). Grumpy Owl isn’t very impressed with you right now. I adore falcons and owls, and I really wanted to get my picture taken with one, but I couldn’t decide which one! Then, I saw a little pygmy owl, and I was instantly smitten! He was so light and tiny! There were also booths with different games to play, including games of chance. One involved plastic straws with little rolled-up slips of paper tucked inside. You had to use a nail to poke out the slip of paper, and that paper had a number. If you matched the number to a number on an item showcased in the booth, you won that item. I won a cubic zirconia cluster ring, so that was a nice little souvenir. We really wanted to win a bottle of Scotch Whisky to take home, but we weren’t quite that lucky. Despite not scoring a bottle of hooch, this quickly turned into one of our favourite days on our trip. A big part of that, no doubt, was that we went in with no real expectations of what we would encounter, so everything was a pleasant, unexpected surprise. A beautiful day and a great turnout for the fair! Once we were done poking around the fair, we went on to see the actual New Lanark mill. Well, a surprising variety of things, actually. For people interested in history, this is definitely a great site, obviously. New Lanark also offers a history exhibit in the form of a Disney-esque-style ride, called the Annie McLeod Experience. Set up in the basement of one of the mill buildings, this ride takes you through 1820’s life in the mill through the eyes of a young girl, Annie McLeod. Well, her ghost, more accurately. If that sounds a little creepy and weird, you wouldn’t be far off; it’s definitely an unusual take on your average dry history lesson about child labour in the 1800’s. But somehow in this context and environment it works, and it was actually well done and very eye-opening. There is also an interactive gallery showcasing Robert Owen’s concepts of childhood education. One of the many cool things here to see is the spinning frame in operation. They only make wool here now, but once made cotton as well. It’s pretty darn loud, I can’t imagine what a full room of those contraptions would have sounded like! Other areas of the mill house temporary exhibits, so this is a site that can keep you busy for quite a while. There is also a really lovely nature walk, part of the Clyde Walkway, that takes you through wooded forests, past historic bridges, and even to the Hall of Mirrors. The view of New Lanark from the walking trail. Gorgeous! If you really want a treat, part of the old mill building is now a boutique hotel, so you can actually stay on site. There’s something here for everybody’s interests. Since we were there during their fair, we indulged in fair food: hot dogs, cotton candy, and hot cups of soup since we were a little chilly when we first arrived. But there are also three nice restaurants on site, so there’s plenty to choose from. The Mill Cafe also offers afternoon tea with a selection of sandwiches, scones and other sweet delights. Unfortunately at the time, I hadn’t picked up knitting needles or a crochet hook for several years. So even though I walked back to their yarn-stuffed-wall several times to longingly stroke and fondle the soft, squishy balls of textured goodness, I chose not to buy any. This was a decision I would come to regret not long after, when I started crocheting again. Dang. Ordering the wool online wouldn’t be the same as buying it on holidays either. Sigh. Well it taught me that sometimes impulse buying can be justified. New Lanark is roughly halfway between Glasgow and Edinburgh, about an hour in either direction. It’s easy enough to drive to if you choose to rent a car, but you can also approach it by bus from Glasgow’s Buchanan Station and Lanark. Or you can take the train from Glasgow Central or Motherwell to Lanark station. From here you have to grab a train or cab the rest of the way. 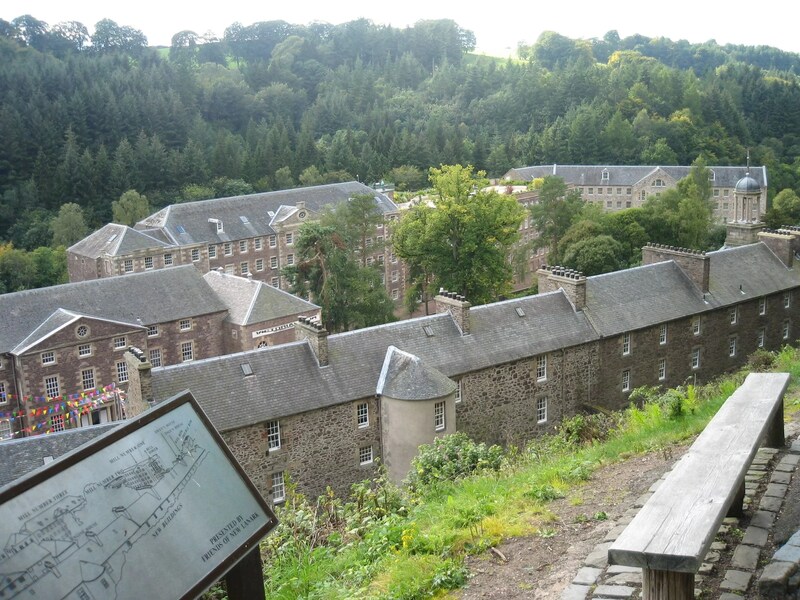 This entry was posted in Festivals and Events, Scotland and tagged new lanark, scotland, woolen mill by Darlene. Bookmark the permalink.